Staining of canine lymph node tissue with ABIN683788. The primary antibody ABIN683788 was used at a 100 fold (A and B) and 500 fold (C and D) dilution. 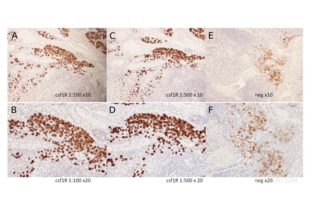 A negative control without primary antibody (E and F) was used to verify the specificity of the stain. Please refer to the protocol for detailed information. Images in the upper row (A, C, and E) were captured at 10x magnification, while the images below (B, D, and F) were taken at 20x magnification. 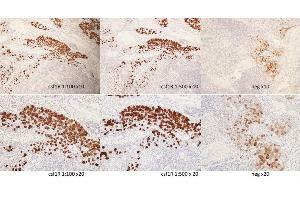 Read validation report #100091 for application Immunohistochemistry. Staining of canine lymph node tissue with bs-3077r. The primary antibody bs-3077r was used at a 100 fold (A and B) and 500 fold (C and D) dilution. A no primary antibody negative control (E and F) was used to verify the specificity of the stain. The blocking step with avidin and biotin was omitted for the no primary antibody negative controls. As a result, there is some unspecific staining in these sections. Images in the upper row (A, C, and E) were captured at 10x magnification, while the images below (B, D, and F) were taken at 20x magnification. 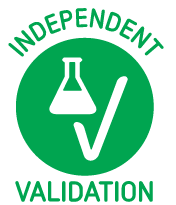 Image was kindly submitted by a researcher via the Antibodies Online Independent Validation Program. This protein tyrosine kinase transmembrane receptor is the receptor for colony stimulating factor 1, a cytokine which controls the production, differentiation, and function of macrophages. This receptor mediates most if not all of the biological effects of this cytokine. Ligand binding activates the receptor kinase through a process of oligomerization and transphosphorylation. The encoded protein is a member of the CSF1/PDGF receptor family of tyrosine protein kinases and contains 5 immunoglobulin like C2 type domains. CD115 is expressed by cells of the monocytic lineage and by progenitor cells. Mutations in this gene have been associated with a predisposition to myeloid malignancy. Król, Majchrzak, Mucha, Homa, Bulkowska, Jakubowska, Karwicka, Paw?owski, Motyl: "CSF-1R as an inhibitor of apoptosis and promoter of proliferation, migration and invasion of canine mammary cancer cells." in: BMC veterinary research, Vol. 9, pp. 65, 2013 Method employed by authors: Immunohistochemistry (IHC), Western Blotting (WB) Further details: After 30 min incubation in 5% bovine serum albumin (Sigma Aldrich) the rabbit polyclonal anti- p-CSF-1R (Tyr 723) antibodies diluted in 1% bovine serum were used, and then the slides were incubated at +4�C overnight. 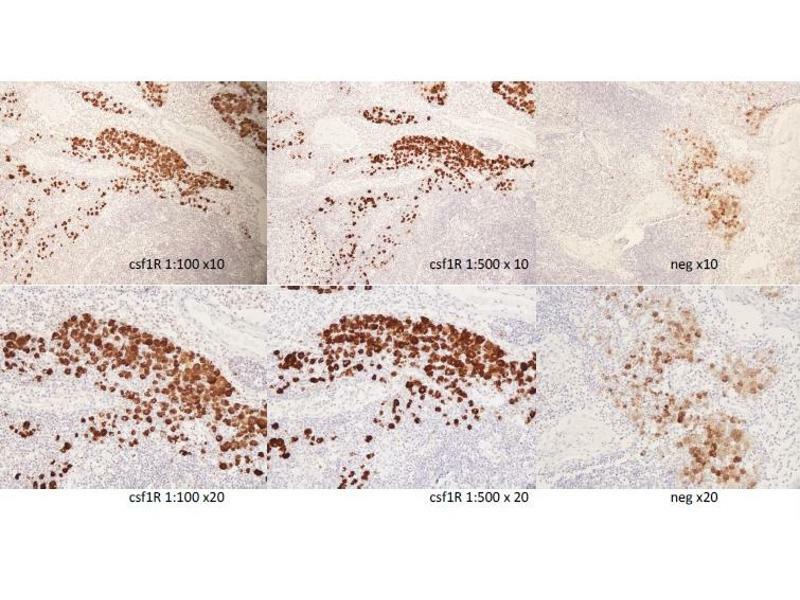 Notes The CSF1R antibody ABIN683788 specifically labels the targeted antigen in canine lymph node samples in IHC. Canine lymph node tissue is dissected and fixed in 4% buffered formalin ON at RT. fill the outer chamber with 500ml distilled water. fill a plastic jar with diluted Antigen unmasking solution (Vector, H3301) diluted 1:100. Boil sections for 8 minutes, turn it off and leave for 1h. Rinse sections with distilled water 3 times. Rinse sections with 0.05M Tris-HCl pH7.6, 3 times. Block sections in normal goat serum (Vector, Vectastain ABC-Elite kit, PK 6101, lot 300712) diluted 1:50 for 1h at RT. Blot excess serum from sections; do not rinse. 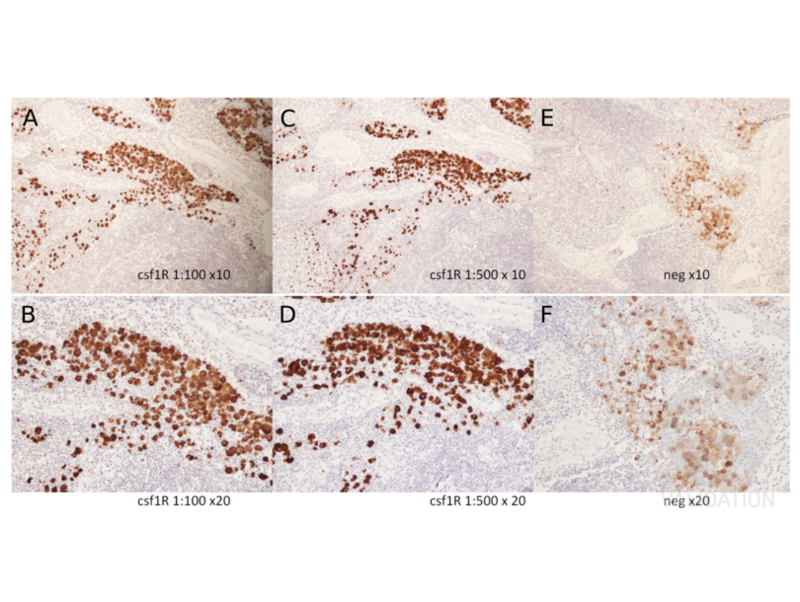 Incubate sections with primary antibody rabbit-anti CSF1R antibody (antibodies-online, ABIN683788, lot 9I02V3) diluted 1:100-1:500 in with 0.05M Tris-HCl, pH7.6 ON at 4°C. Include no primary antibody negative controls. Rinse sections with 0.05M Tris-HCl pH7.6, 3 times. Keep negative controls in a separate jar. Incubate sections with biotinylated secondary antibody anti-rabbit (Vector, Vectastain ABC-Elite kit, PK 6101, lot 300712) diluted 1:200 for 30min at RT. Mix 20µl of reagent A and reagent B of the Vectastain Elite ABC HRP kit (Vectorlabs, PK-6101, lot 300712) in 1ml 0.05M TrisHCl pH7.6 and leave the mixture for 30min at RT. Incubate sections in the ABC reagent mix for 45min at RT. Rinse sections with 0.05M Tris-HCl pH7.6 3 times. Mix thoroughly 2.5ml and 1 drop buffer stock. Add 2 drops DAB and mix thoroughly. Add 1 drop H2O2 and mix thoroughly. Stain sections with Mayer HTX (Histolab, 01820, lot 00811.) for 2-3min at RT. Rinse sections in tap water for 5-10min. 95% ethanol twice for 2min. 99.5% ethanol twice for 2min. Mount sections in Pertex mounting medium (Histolab, 00811). Dry sections in a ventilated place. Image acquisition (x10 and x20 objectives). Experimental Notes The blocking step with avidin and biotin was omitted for the no primary antibody negative controls. As a result, there is some unspecific staining in these sections. ABIN683788 worked nicely on the canine lymph node that was used as a positive control.